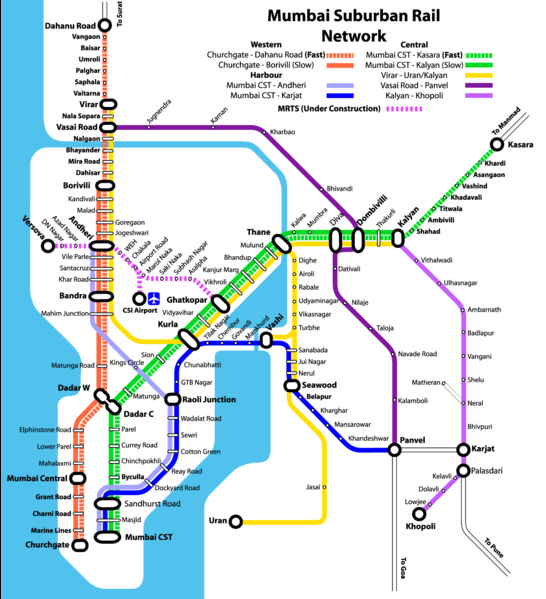 The Western Line is the name given to all routes of the Mumbai Suburban Railway operated by Western Railways. 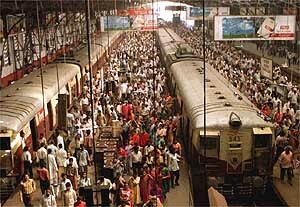 It is a public transit system serving the Mumbai Metropolitan Region, Maharashtra. It consists of 36 stations from Dahanu Road to Churchgate. The entire line is at grade. Two corridors (one local and the other through) on Western Railway run northwards from Churchgate terminus parallel to the west coast up to Dahanu Road (120 km). These corridors are popularly referred to as 'Western Line' by the locals mainly because it is operated and owned by the Western Railways. Electric Multiple Units (EMUs) ply between Churchgate and Virar, while Mainline Electrical Multiple Units (MEMUs) service the section beyond Virar till Dahanu Road (60 km).